Man of La Mancha is a classic musical dating back to 1965, inspired by Wasserman's 1959 teleplay, which was in turn inspired by the all-time classic 17th century novel Don Quixote, by Miguel de Cervantes. If Cervantes had known, back in the 1600s, that his story would resonate so powerfully down the ages, he'd be thrilled. And 21st century audiences are about to be thrilled all over again by this ancient, delightfully eccentric, always-relevant story. Meet the mad old knight Don Quixote, whose story is told by Cervantes to a group of fellow prisoners while they're waiting to be judged by the Spanish Inquisition. The show is packed with magical tunes including The Impossible Dream, so popular it has a place in the American lexicon, known and loved far and wide. The original 1965 Broadway production ran for more than 2,300 performances and achieved an impressive five Tony Awards including Best Musical. It has been revived on Broadway four times so far. It has made friends and influenced audiences across the world, with foreign language productions in a vast range of languages and dialects including Dutch, French, Hebrew, Irish, Korean, Icelandic, Bengali, Gujarati and Uzbek, as well as nine separate Spanish dialects. The musical's many show tunes include Man of La Mancha, Food, Wine, Aldonza!, It's All the Same, Dulcinea, I'm Only Thinking of Him, We're Only Thinking of Him, and The Missive, and they're just the tip of the iceberg. This time around it's English National Opera who are bringing the musical to the London Coliseum. It stars Cheers' Kelsey Grammer and the brilliant Australian opera singer Danielle De Niese. And it's on for a limited 6 week run. Grammer enjoyed his West End London stage debut in 2017, in Big Fish. His first Broadway musical was a dazzling revival of La Cage aux Folles, for which he was nominated for a Tony Award. He also created the roles of Charles Frohman and Captain Hook in Broadway's Finding Neverland. Danielle De Niese has been singing since childhood, when at nine she won an Aussie TV talent competition Young Talent Time. 2005 saw her playing Cleopatra in a production of Guilio Cesare at Glyndebourne, and since then her voice has taken her around the world. This fantastic production is directed by Lonny Price, of Lady Day at Emerson’s Bar and Grill fame. This show is recommended for people aged 13 and over. We have a great selection of cheap Man of La Mancha tickets. We can help you save up to 70% on Man of La Mancha tickets! 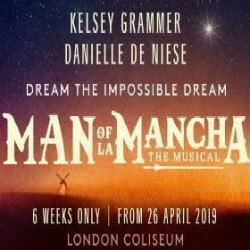 If you're looking for discount theatre tickets have a look below for our latest offers for Man of La Mancha at the London Coliseum. 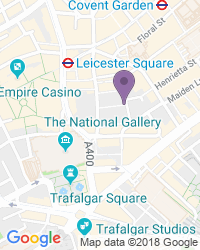 Use the search box at the top left of this page to search for Man of La Mancha tickets availability.